SignalScope 3 builds on SignalScope's tradition of award-winning design and precision measurement capabilities by building on advanced technology developed for Faber Acoustical's flagship product, Electroacoustics Toolbox. SignalScope is a modularized, multi-channel dynamic signal analyzer and data acquisition platform for Mac. 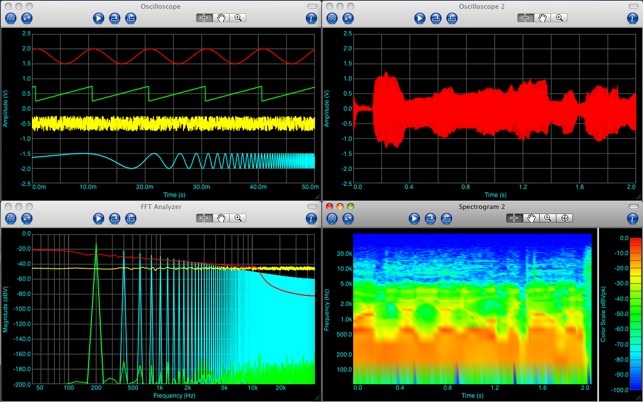 It brings powerful tools to the Macintosh platform for multi-channel, audio-band data acquisition and real-time analysis of electrical, acoustical, and electroacoustic signals and systems. The software is designed to work with any Mac-compatible audio hardware and supports multiple channels of 8, 16, 24, or 32-bit data with sample rates as high as the hardware will support. SignalScope is a project-based application, which allows you to configure and save project files. Projects may contain one or more tools available in the toolbox, along with any captured data associated with those tools. SignalScope allows for the creation of up to two tools of a each type. 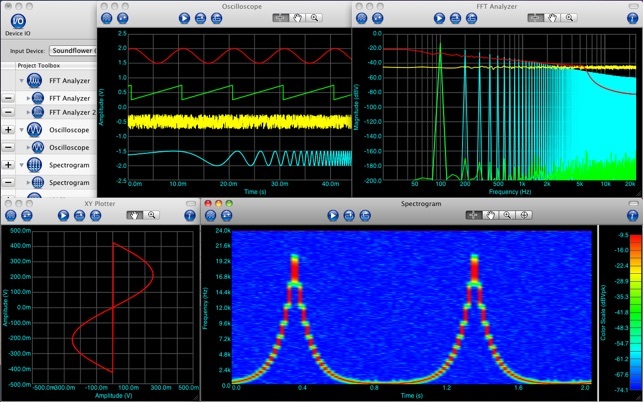 For example, a project may contain an oscilloscope, two FFT analyzers, and two spectrograms. The oscilloscope and FFT analyzers may each simultaneously analyze multiple input channels of a single device. SignalScope also offers advanced capabilities for configuring input device parameters and assigning labels, units, and transducer sensitivities to individual input channels. Added support for automatic unit selection and factory calibration for PCB Model 633A01 digital accelerometer and Model 485B39 USB ICP interface. It's one of the apps out there with the most functionality. Still it exhibits some strange behavior when capturing data from an external all digital 24bit USB sound card capturing pure digital data; the output seems to roll-over due to the 24 bit data (almost as if it's assumed to be 16bit?) and the fact that the scale can only be Volts or dBV is inacurate. One should have the ability to select dBFS as a scale when dealing with 100 digital data. The result is bogus data I can't trust. Not worth the money for sure. SignalScope is useful, but it's a poor value. The artificial limitations do nothing to convince me that I need to drop a few hundred samolians on their flagship product. I erased my original review because it contained my misunderstanding.